All plants need a source of light – this enables them to photosynthesise and produce energy. In nature, plants get their light from the sun but when growing indoors an alternative source of light needs to be provided. This is where horticultural lighting (or a ‘grow light’) comes into play. 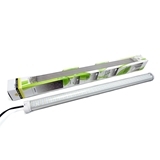 Grow lights come in many forms; from compact fluorescent lighting (CFL) to high pressure sodium lights (HPS), there is always a suitable light for any plant or grow space. For propagation; small plants; seedlings; or for small areas where high temperatures may cause a problem the ideal solution is a CFL. 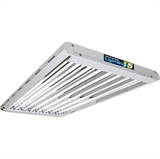 These lights are usually a low wattage (ranging from 24W to 125W) and tend to be very energy efficient, producing low amounts of heat. They are still able to produce results with fruit producing plants; however you should expect a smaller yield when doing so. 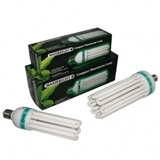 For larger types of plants; flowering/fruiting plants; or large grow areas, the ideal lighting system usually contains a HPS lamp. 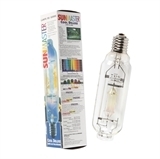 These bulbs come in three main varieties: Metal Halide lamps (Blue Spectrum); Son-T lamps (Red Spectrum); and dual spectrum lamps. 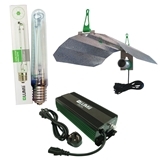 Metal Halides are used primarily for vegetative growth, Son-T’s are used for flowering and dual spectrum bulbs may be used for both vegetative and flowering stages. 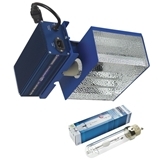 HPS lamps range from 250W up to 1000W and require a transformer (also known as a ballast) to be used correctly.  Ballasts come in many forms but usually comprise of a magnetic, digital or dimmable transformer. 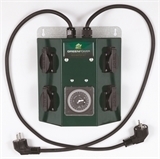 HPS lights should also be used with a contactor which will prevent any timers from fusing. 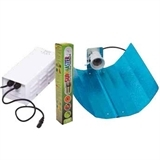 Finally, to get the most out of any horticultural light, a reflector should be used. 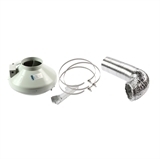 These are available, again, in many forms but are usually standard, parabolic or air-cooled. 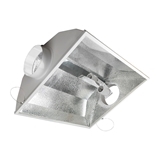 Click on a section to the right to find out more about each component in a lighting system.